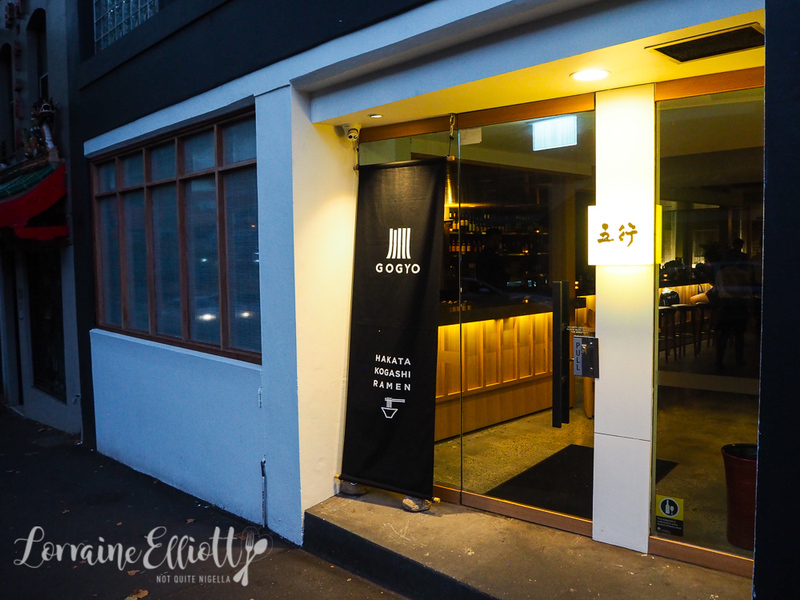 Gogyo Ramen Arrives in Sydney! 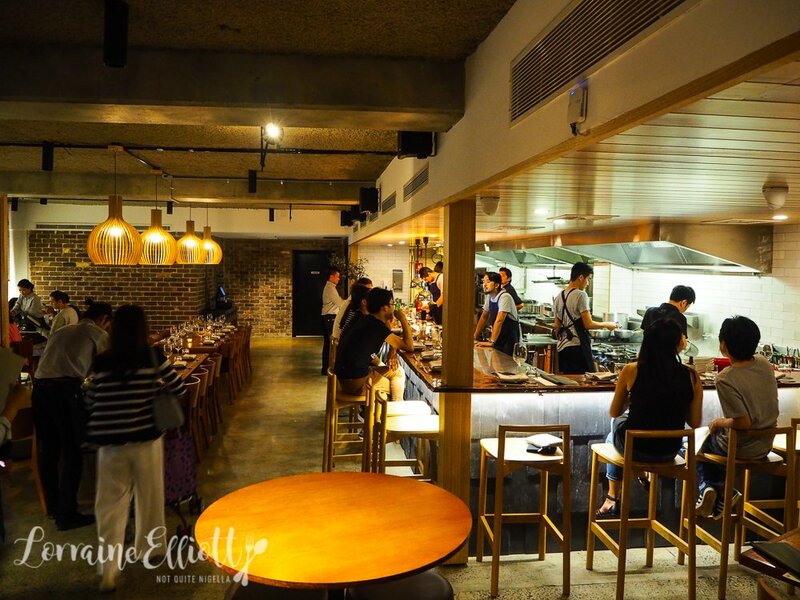 The latest branch of the popular Japanese ramen chain is in Sydney's Surry Hills. Owned by the Japanese Ippudo parent company, it promises a range of a la carte dishes as well as their signature item: charred miso ramen. 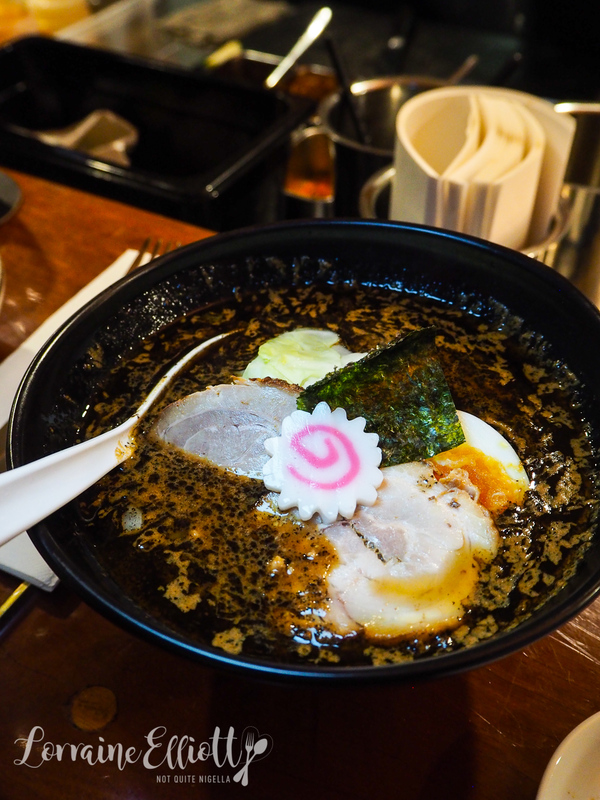 Gogyo (meaning the five elements of earth, fire, water, metal and wood) has long queues of people waiting to try this ramen in Japan and Hong Kong. So what exactly is charred miso ramen and how is it made? To make charred miso ramen, the miso is cooked in 300C lard in a wok where sky high orange flames erupt. Chicken broth is then added which extinguishes the flames and this produces the unique ramen soup (although I have to add that this spectacle doesn't happen while we are there alas). I do a bit of a double taken when I walk into Gogyo. 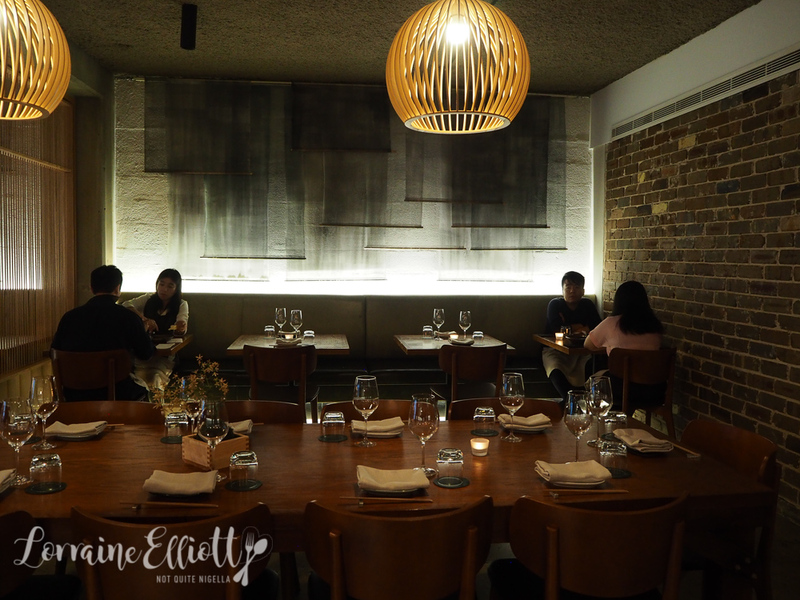 It's located on Albion Street in Surry Hills at the former site of the much missed favourite Salaryman (also a ramen and-then-some restaurant). At first glance the look of the restaurant is similar, the layout identical, although the mural has been covered and blonde wood decor has replaced the grunge and personality. Mr NQN, Garth and I take our positions at the bar to watch the chefs do their thing. Nina is on her way and joins us later. Service is very friendly and when there isn't a hook for my bag, they bring a box to place it in that sits under my bar stool. There aren't any cocktails on the menu so I skip drinks while Mr NQN orders a sweet potato shochu, Garth orders a beer and Nina wine. A few of the items need a bit of an explanation. I was wondering if the uni-corn tofu was a colourful tofu or if it were uni (sea urchin) and a corn tofu. It's the latter, a smooth textured, wobbly Rubenesque corn flavoured tofu with sliced baby corn and sea urchin perched on top. 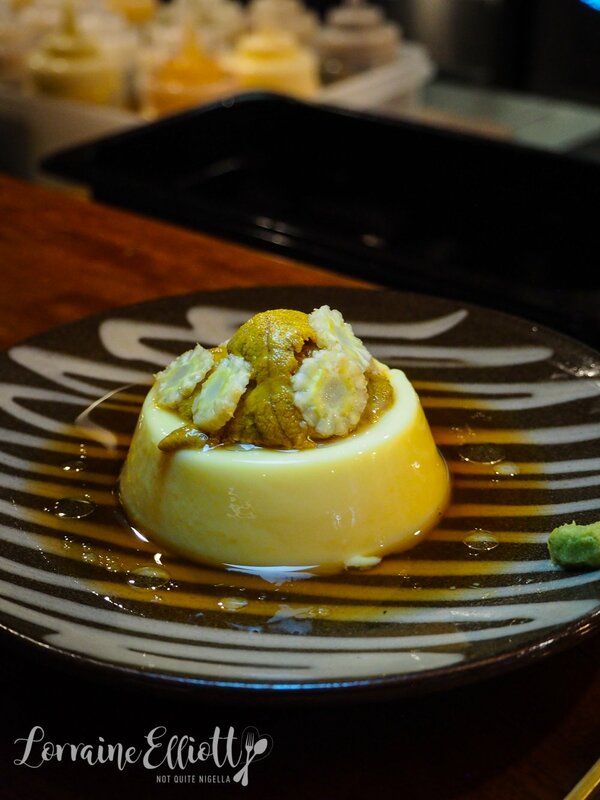 It's a dish that is all about soft textures and the tofu melts in the mouth. For any tofu haters, give this a go as this tofu has flavour and reminds me of Kyoto tofu. 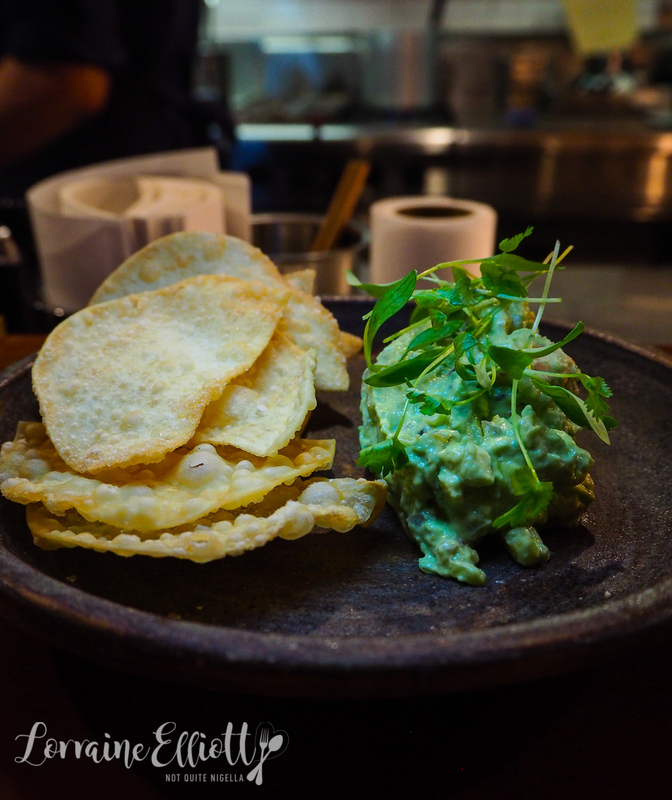 Sometimes you get a feeling that you'll like something because you like all the components and this is why I ordered the king prawn guacamole. It is mashed avocado and chopped prawns with microherbs on top. They come with deep fried gyoza skin crackers and are a great dish to share. Just spread and crunch. Age means fried and isobe is a type of seaweed. 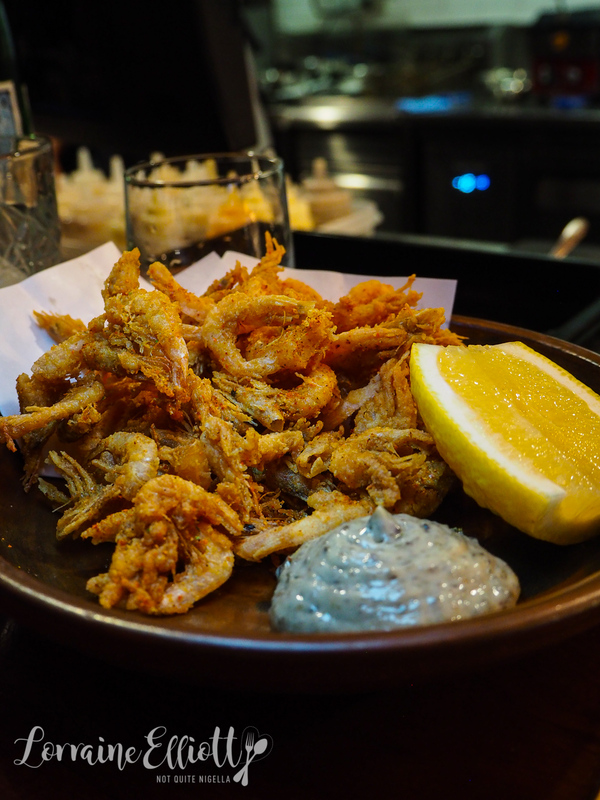 The school prawns are given that extra bit of flavour from the crumbled nori in the batter and the extra umami is carried through with the nori mayonnaise on the side. 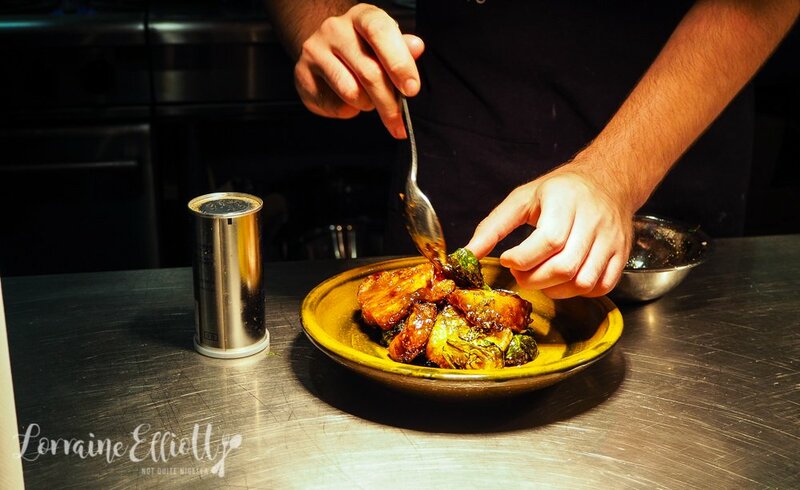 It's a good dish to share and it is a generous serve. 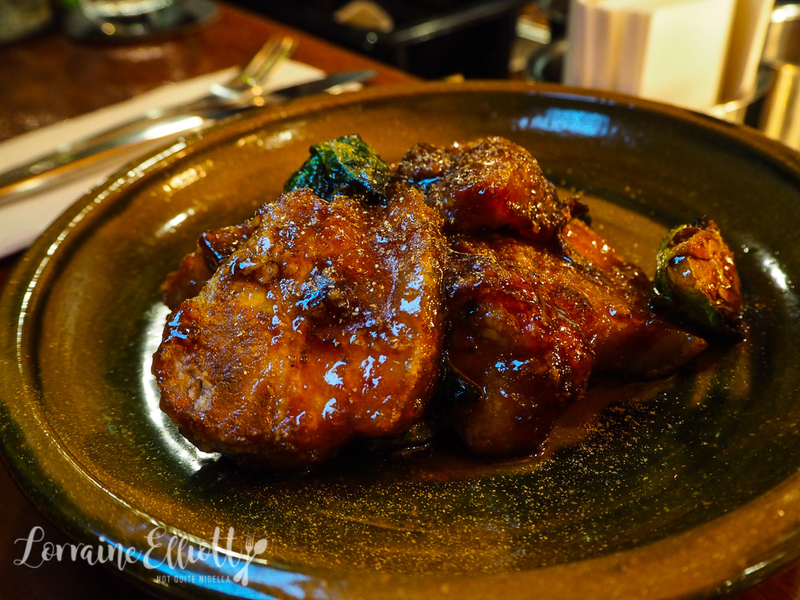 The pork belly is a twice cooked pork belly. First it is simmered in a flavoursome sauce and then deep fried just before serving to crisp it up. It comes with halved Brussels sprouts and is unctuous and rich. I would have loved a bowl of rice to go with this (there are two on offer: chashu and sashimi gohan or rice). 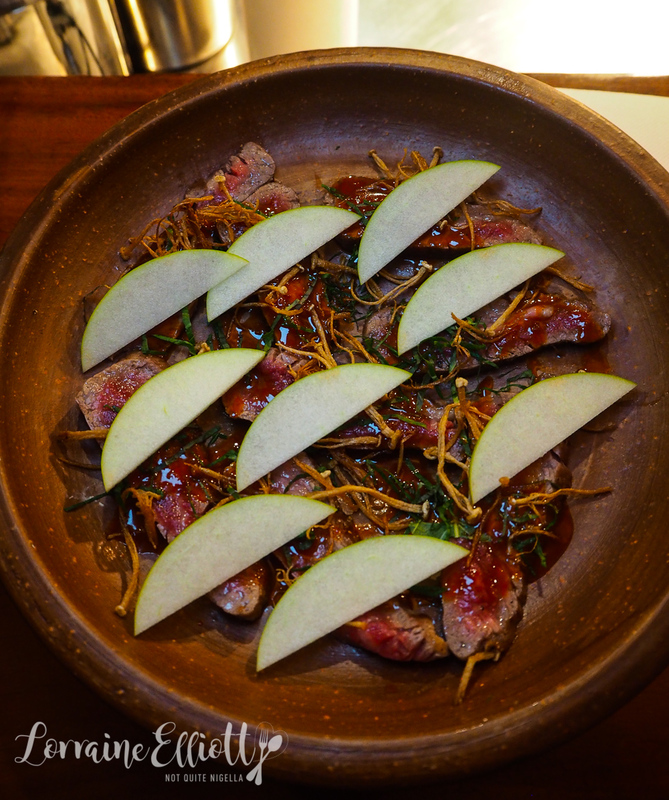 The wagyu tataki comes as thin slices of wagyu (marbling score 8-9) and topped with deep fried enoki mushrooms and paper thin slices of green apple. The beef just melts in the mouth but with a nice finish from the Granny Smith apple. I wasn't quite sure what the rock potato would entail. 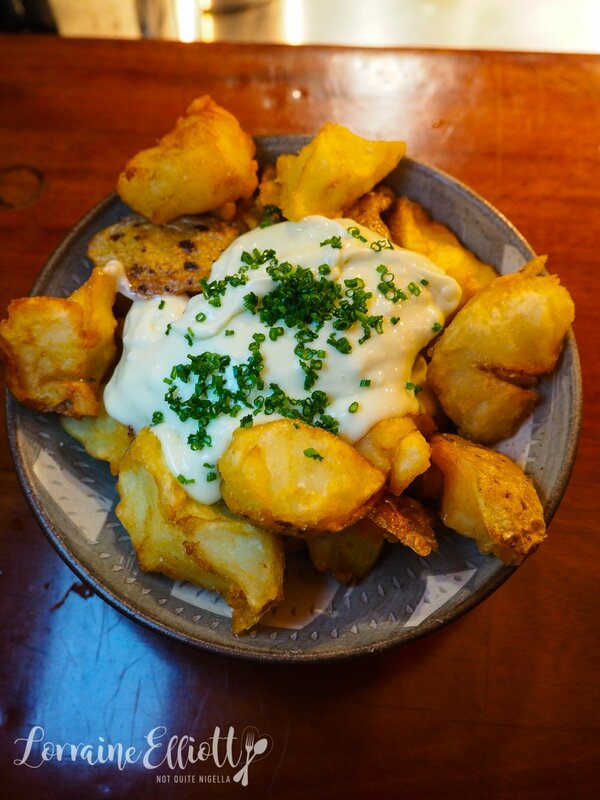 They're super crunchy potatoes topped with a kombu kelp aioli and chives. This too is a large dish and even with two hungry men we have trouble finishing this. 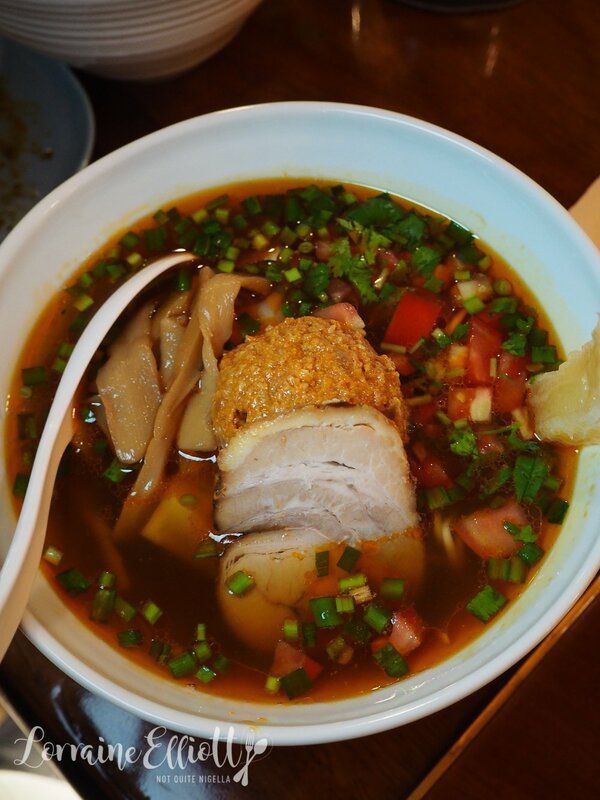 As mentioned, Gogyo is known for the Kogashi Miso ramen. The ramen here come with two sizes of noodle: a #16F medium thin low hydrolysis noodle and a #18W medium hydrolysis noodle. The Kogashi comes with the thinner #16F noodle with a charred miso base, original chicken broth, half umami egg and slices of pork belly chashu. They hand us black bibs and explain that it is because the ramen is very dark in colour. Indeed it is, almost dark grey or brown with dark flecks. We dig in and it's an intense, slightly sweet broth. It's good but I don't know if I could finish a whole bowl of this as it is very rich and buttery and some people have warned of a sore throat afterwards. I am more about the chilli shoyu, all subtlety be damned. With a spicy chicken broth, a ball of habanero pork mince, bamboo shoots, finely diced tomato, coriander and pork belly chashu it is a strong in heat and generous with the additions. But the part I like the best are the thicker noodles. The thinner ones are softer while the thicker noodles have a real bite to them. They're not hard but they're springy and that's how I prefer ramen. 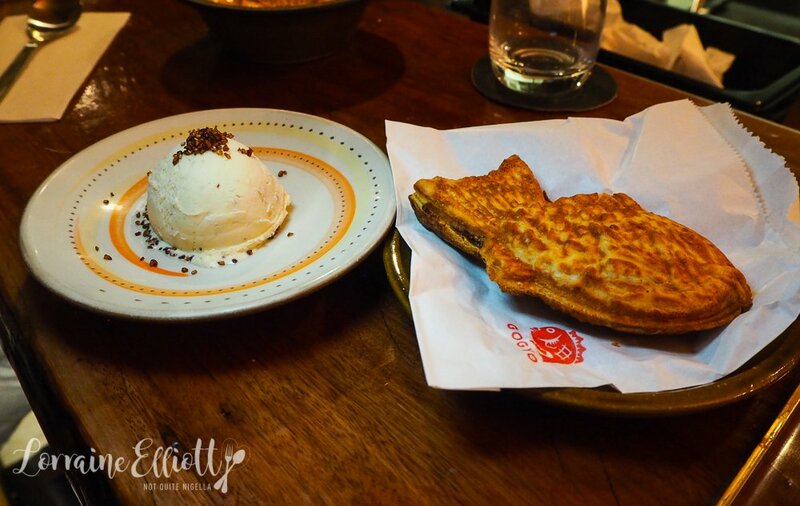 Once you've tried a croissant taiyaki you can't help but wish that all taiyaki were made with crispy puff pastry. This one is a regular taikyaki and there are two fillings available: red bean and Nutella. We went with the red bean one which comes with a scoop of nutty roasted seed ice cream on the side. 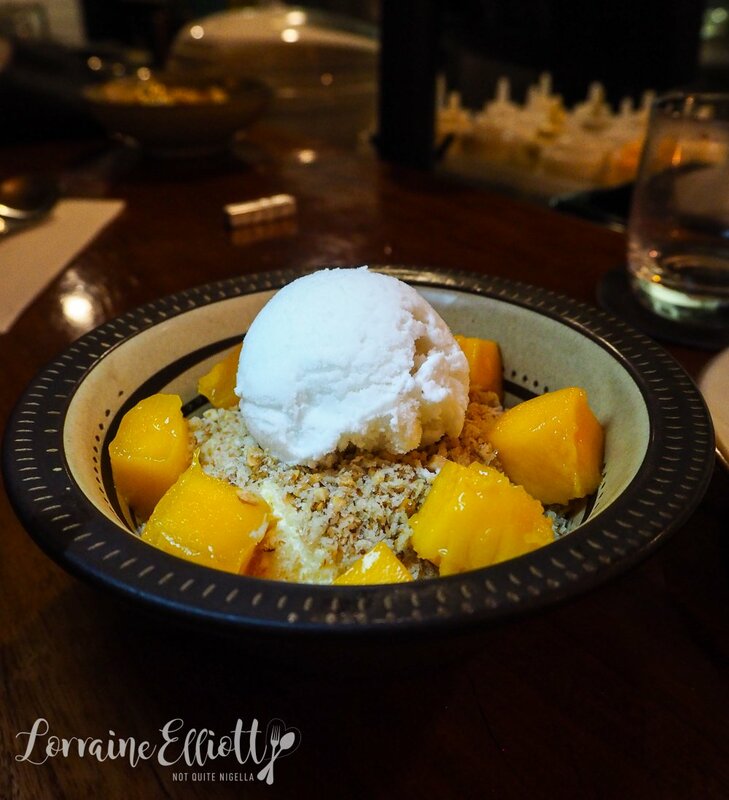 We all prefer the mango dessert with yuzu curd and toasted coconut. It's tropical and refreshing with a Japanese element with the yuzu and even dessert averse Nina samples both and gives this a big thumbs up. So tell me Dear Reader, are you a ramen lover? Do you prefer thinner, softer ramen or thicker, springier ramen? Have you ever queued for food?